Note: Use plastic, ceramic, or strong paper bowls with lips that are wider than the bottoms so that the dried papier mâché can be easily removed. Mix the wheat paste to a cream-like consistency and put into bowls, planning one for every two children. Tear newspaper and white paper into roughly 1- x 3-inch strips. Prepare a non-stick surface, such as wax paper, for drying the bowls. Set out the wheat paste, strips of paper, petroleum jelly with brushes, plastic wrap, and masking tape. Set out bowl-shaped forms, planning one for each child. 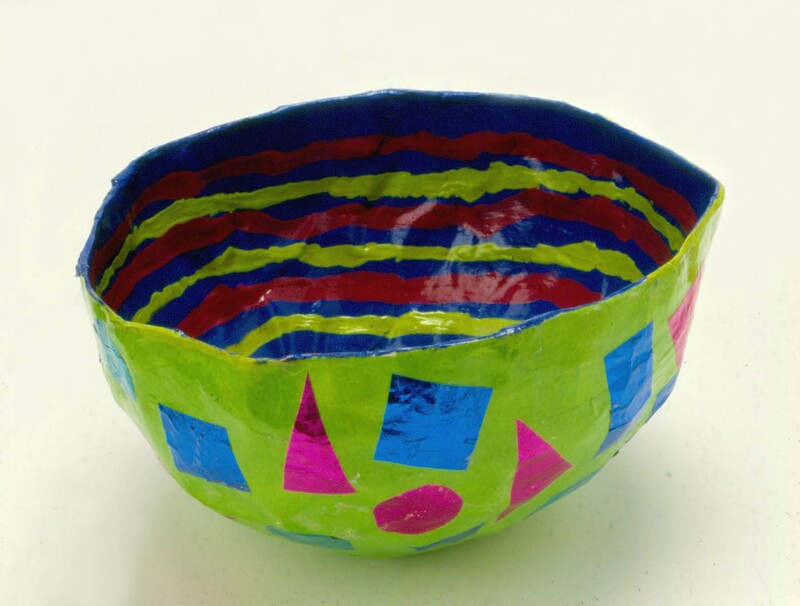 In this session the children will be making bowls by putting papier mâché over bowl-shaped forms. Explain that the paste-soaked paper will become hard after it is dried and can then be decorated. Show the children how to prepare the form. Apply a thin coat of petroleum jelly to the outside of the form and then wrap it with plastic wrap, smoothing the wrinkles as much as possible and taping the loose ends against the inside. The petroleum jelly will help the plastic wrap cling to the form and the plastic wrap will allow the papier mâché to be easily released once it dries. 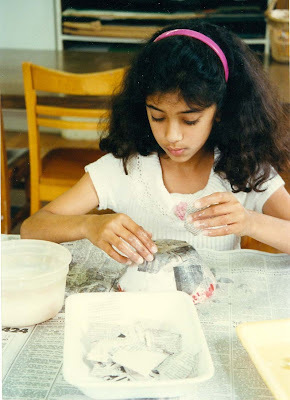 Demonstrate how to apply the papier mâché to the prepared form. Explain that white paper will be used for the first layer to create a surface that is easier to paint. Dip the white paper strips into the paste and pull the wet paper between two fingers to remove excess paste. Lay the dampened strips on the form, following its shape carefully while overlapping and smoothing the edges. Use newspaper strips to apply at least two more layers. 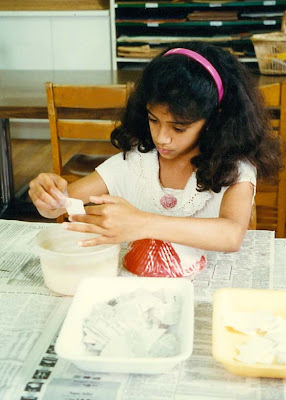 Have the children apply one layer of white paper and two layers of newspaper to the forms, smoothing the surface as much as possible before letting the forms dry. Note: Dry the bowls upside down on a non-stick surface. Set out wheat paste, white paper strips, and scissors. 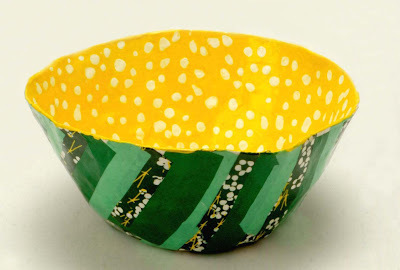 Have available, but set aside, the patterned papers so that, if the children have extra time, they can begin to plan the designs for the bowls. In this session the children will be completing the bowls to be decorated in the next session. Show the children how to release the dried papier mâché bowl from the form by carefully sliding it off and discarding the plastic wrap. Trim the lip, or top edge, of the bowl with scissors. Then use white paper strips to carefully wrap the trimmed lip and cover the outside of the bowl, making sure that all edges are smoothed before letting the bowl dry. Have the children prepare the bowls for decorating in the next session. Note: Dry the bowls on a non-stick surface. If there is extra time, have the children look through the patterned papers to start planning their designs. Set out the dried bowls. Set out the patterned paper for cutting, scissors, and wheat paste. In this session the children will be using cut paper to design the outside surface of the bowls. Have the children design the outside surface of the bowls, wiping away extra paste and smoothing the edges as much as possible. Set out the tempera paints, brushes, containers of water, and sponges. Set out containers with lids for saving mixed colors. In these two sessions, the children will be painting designs on the insides of the bowls. Explain that it is important that the design on the inside of the bowl coordinate with the outside of the bowl. This can be done by repeating or contrasting the shapes and colors in the patterned paper. Have the children mix their colors, and then cover the entire surface on the inside of the bowls with the first layer of paint. Let the bowls dry between sessions before painting on details. Note: When the bowls are completed, have an adult apply a coat of polyurethane. The amount of time needed for each session will depend on the size of the bowls, the amount of experience the children have working with papier mâché, and the time needed for drying the papier mâché between applications. Newspapers that are printed with vegetable inks are preferred because they are more flexible. Newspaper tears easily when ripped vertically. White liquid glue can be substituted for the wheat paste. Applying petroleum jelly to the form will release the dried papier mâché, but it leaves a greasy residue on the papier mâché bowls. Using only plastic wrap can be awkward for small hands to manage. The combination of petroleum jelly and plastic wrap works well. 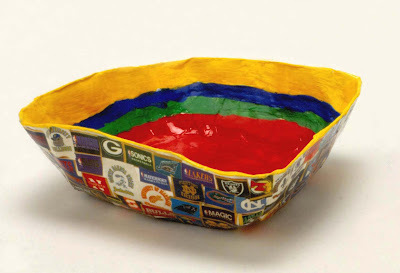 Using white paper for the first and last layers of papier mâché creates a cleaner surface for designing the bowls. 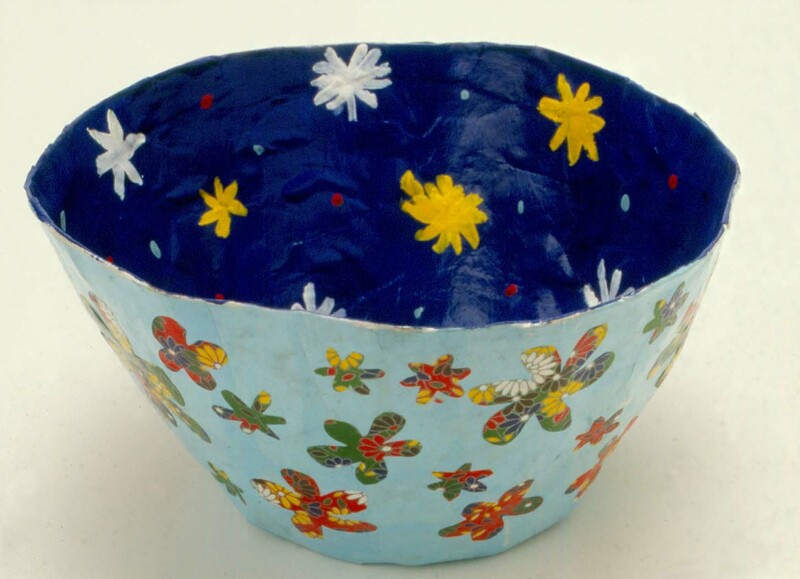 An alternative would be to use only newspaper for the papier mâché and apply gesso to the dried bowls before adding the paint and cut paper. Are the bowls sturdy with no weak areas? Are the surface and lip of each bowl carefully smoothed? Discuss how the designs on the inside of the bowls were made to coordinate with the outside. I have some sports stickers at home. Can I bring them in for my bowl? I want to make the inside of my bowl just yellow. Can I cover my bowl with this blue paper and then cut out my own flowers to attach on top? Your stickers should work as long as the paper is sturdy enough to handle while it is wet. You can paint the inside of your bowl a solid color, but first look carefully to be sure there isn’t a design that you could use to make it better coordinate with the outside. Cutting shapes to apply over a solid color will work very well.